Linear guides and rails provide a smooth, precision, guiding surface on which the rolling element of a linear bearing rides. Linear bearings are available in many configurations, with differing attributes such as stiffness, smoothness of motion, profile height, cost, material, and rolling element type. Some of the more common types include crossed roller bearings, linear motion (LM) guides, bushing style bearings (plain bearings or with balls), needle roller bearings, roller bearings, splined shaft bearings, and various guide wheel configurations. Material choices for linear guides and rails include aluminum, polymer or plastic, stainless steel, or steel. Material features include corrosion resistance, case hardened, thru hardened, and not hardened. 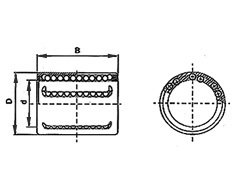 Important dimensions to consider include guide width or diameter and guide length. Features common to linear guides and rails include continuously or intermittently supported, end-supported, clean room ruse, pre-drilled holes, self-aligning, and vacuum compatible. NSK linear slides are designed for superior linear motion. NSK has designed different series of linear guides to meet the diverse needs of the various industries we serve. For more specific applications, NSK offers special coatings, lubricants, accuracies and custom designs. Maintenance-free operation with K1 lubrication units are available on most NSK linear guides. NSK Ball Screws have been continuously developed through cutting-edge tribology (friction control technology), and NSK has taken its place as the largest volume manufacturer in the world with its outstanding production and quality control techniques. 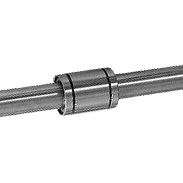 We offer a complete selection of Ball Screws. Whether you need a unique custom design for a demanding application or a standard off-the- shelf ballscrew offering ease of design and shorter lead times, NSK has the solution from miniature to ultra-large sizes, for machine tools, injection molding machines, and general machinery as well as for use in special environments, such as semi-conductor and LCD production equipment. With the world's leading Ball Screw producer, NSK has been contributing to industrial growth. The Monocarrier multi-functional actuator represents a lightweight, compact single axis actuator that embodies the technology that NSK has accumulated over the years, with an all-in-one structure integrating a Ball Screw, Linear Guide, and support bearings. These linear actuators offer simplified design and installation across many industries. NSK Monocarriers offer long-life, maintenance-free operation and are suitable for a wide range of applications.